Be on the lookout for a Beth Mason paid robocall coming your way. Yesterday, the first reports of a Beth Mason funded robocall struck the Mile Square. "With a real person saying he was calling for Beth Mason... saying we need to do more to protect the civil liberties of Hoboken residents. I hung up at that point from sheer laughter." We could of course ask Beth Mason to confirm but she won't talk unless it's scripted through her political operatives in an advertising friendly publication. 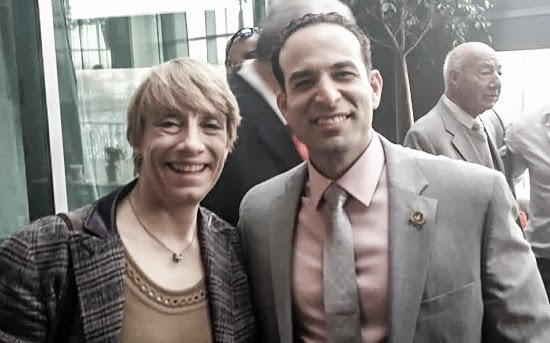 Beth Mason, a clear and present danger to the free speech of Hoboken residents. Beth Mason is concerned about civil liberties? Well how about First Amendment civil liberties? There are five civil liberties protected by the First Amendment: freedom of speech, freedom of religion, freedom of assembly, freedom of press and freedom of petition. Do you think suing numerous Hoboken residents does harm to civil liberties? MSV the most commented Hoboken website continues to suffer with numerous residents who only feel safe to do so under the anonymous moniker "guest." They don't want to be subjected to a Mason family funded SLAPP (Strategic Lawsuit Against Public Participation). Or does civil liberties only apply to Beth Mason's misguided efforts to oppose a federal meeting properly noticed and open to the public for an Old Guard ally? The rank hypocrisy of Beth Mason stinks to high heaven. She's writing family checks doing harm to the First Amendment in Hoboken while bankrolling this latest tone-deaf political operation. Another Hoboken resident listened to the Beth Mason "This is illegal" poll and flipped the tables on the pollster. Doesn't sound like Beth Mason can make this case for an HHA connected uptown developer to turn out votes for her in the second ward next year either. Maybe $100,000 in street money will work this time Beth. Update: Another Hoboken resident gets the Beth Mason "it's an illegal meeting call" and opted to have some fun with the pollster saying of an MSV guess of the call's position, "You hit the nail on the head; meeting was illegal because everyone could not get in." Really? That's the best scam Beth Mason's paid brain trust can come up with? "... also they said that it was illegal because other police departments had to be called in. I replied to him that if that was the case then are all parades illegal; by calling the other police departments they were protecting my civil liberties. Silence... I asked him again why the meeting was illegal and they hung up."